December 14, 2017 (JUBA) - South Sudan on Thursday said it had resumed issuing passports after a system failure forced those seeking new passports and renewal of old ones to abandon external travels. The director general of the nationality and passports at the ministry of interior, Majak Akec Malok attributed the cause to technical failure, although multiple immigration officials claimed failure to pay a German-based company its pending arrears caused the problem. 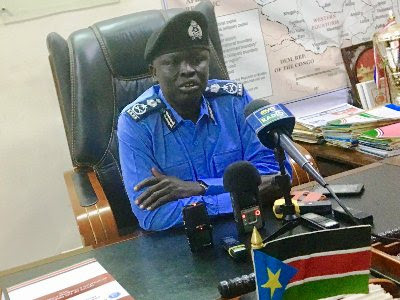 Malok told a news conference in the South Sudanese capital, Juba that problems at immigration were resolved and the department is ready to provide needed services. “We have resumed our operation and whoever that is in need and wants to apply for national certificates and passports, we are ready to serve them,” he said Thursday. The official, however, described as “unfounded” earlier reports that the directorate of passports and immigration could not issue passports since November after its German technology provider shut down its machine after the finance ministry failed to pay $500,000. “When there is an issue which is not clear and it is for the public, you come to us so that we give you the correct information. But if you rely on the unfounded rumours which are usually allegations from the street talks, then you end up misleading the public instead of clarification”, said Malok. According to top immigration official, technical faults that hit the department have been resolved and its staff would work during normal working days in order to clear the load caused by shutdown. “Today, I am giving a statement to the citizens across the country that we stopped producing nationality and passports documents since date 9th last month. There was a technical problem but we have managed to solve it,” he told Sudan Tribune. A former deputy finance minister, Mou Ambrose Thiik was earlier quoted saying the passport and national identification server had been blocked by German company Muhlbauer, after South Sudan failed to pay an annual software license fee of around $500,000.